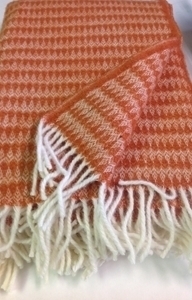 Manufactured using a 100% New Zealand wool.After a long day, come home and wrap yourself in a luxurious wool throw while you watch a favorite movie or read a book.For interior design lovers, draping a wool throw over a sofa or chair is a quick way to add color or texture to a room, even changing the entire mood of the decor. Research shows that when you sleep under wool your heart lowers giving you a more rested and refreshed feeling on awakening. Makes a great gift for weddings or birthdays, they will be an investment to last a lifetime.